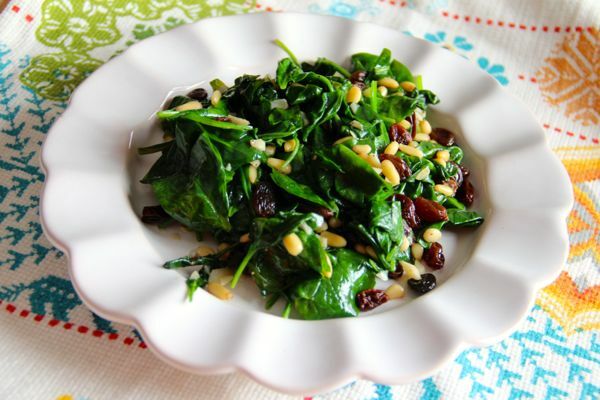 A power packed spinach recipe that features garlicky wilted spinach tossed with pine nuts and raisins. I used to pick up a little serving of a recipe like this from the Whole Foods prepared foods counter. Believe it or not – it was my little treat. Realizing how easy it is to prepare I started making this at home and it very well may be my favorite way to make and eat spinach! Any leftovers I have are enjoyed reheated the next day. This recipe is based on many that originate from the Catalonia region in Spain. The recipes vary with some adding chopped apples to it. The delicious end result is often used as a topping for flatbreads, as a filling for turnovers or cannelloni or as a simple side dish. Spinach can claim a special place among vegetables in terms of its phytonutrient content. Most of the flavonoid and carotenoid nutrients found in spinach that provide anti-inflammatory benefits provide antioxidant benefits as well. Spinach is also an excellent source of other antioxidant nutrients including vitamin C, vitamin E, beta-carotene, and manganese, as well as a very good source of the antioxidant zinc and a good source of the antioxidant selenium. Add the raisins to the boiling water and let sit until the raisins are plump. While the raisins are soaking, heat the olive oil over medium heat in a large sauté pan or Dutch oven. Add the garlic slices and sauté for about 1 minute, stirring frequently. Sprinkle with lemon zest, toasted pine nuts and add pepper if desired. Serve warm.